Martham smock windmill stood to the north of the Repps Road on the south west side of the town. The four storey mill had a brick base to the top of the first floor. The mill was powered by four double shuttered patent sails. H. Shepherd, late of Martham, miller. FOR SALE by Private Contract, a self-winding TOWER CORN MILL with four floors, brick base to first floor, the rest wood, the mill new geared, four new sails, everything in good order with convenient Outbuildings, good Dwelling house, Greenhouse and large Garden attached well planted with fruit trees. Also 7 acres, 20 roods of productive Arable Land near the Mill. All freehold. The owner obliged to retire through ill health. Apply W. Ware, Miller, Martham, Yarmouth. For Sale by Private Contract in consequence of the Death of the owner. A SELF-WINDING TOWER CORN MILL in good repair, new geared throughout , four new sails, good retail trade, nice Dwelling house, with Greenhouse, Warehouse and other Buildings convenient for business, large Garden well stocked with good fruit trees. Apply Mrs. Ware, Miller, Martham, Norfolk. THOMPSON, Robert, Jun. late of Hemsby and Martham, now of Diss, formerly miller and corn dealer now farmer. James Woolterton will Sell by Auction by direction of Mr. George Nichols who is declining business owing to ill health, at the Star Hotel, Great Yarmouth on 7 March 1894. 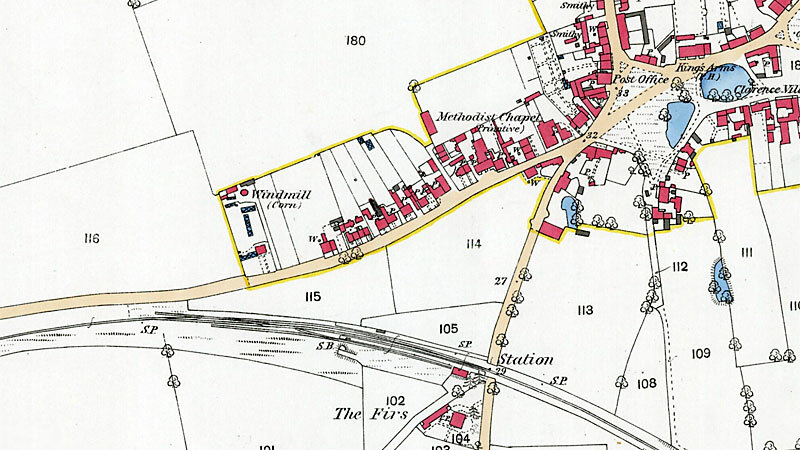 All that valuable property close situate close to the Railway Station, Martham, comprising a substantially erected tower windmill residence, four large cucumber houses and small market garden, now in the occupation of Mr. G. Nichols and his undertenant, E. A. Dyball. Windmill, Granary and cartshed situate at Martham, near the Station, to be let, in thorough good order. Apply to Arthur Balls, Martham. Considerable excitement was caused on Friday morning at Martham, where fire broke out on the premises of Mr. James Arthur Balls, carrying on business as a market gardener. A powerful windmill caught fire through overheating caused by the heavy gale. The police were quickly on the spot and with the assistance of plenty of willing helpers kept the fire from spreading to the adjoining premises. The Rollesby fire engine was soon in attendance but was not required as the fire had been got under control. Great credit is due to Mr. Arthur Edmonds for supplying the helpers with hose and water cart. The property is insured in the Norwich Union Fire Insurance Society, of which Mr. John Fenwick, Town Hall is the agent. Kelly's 1904: Daniel Rust jnr., coal dealer, millwright & machinist & agent for Northern Assurance Co.
Kelly's 1908: Daniel Rust jnr., coal dealer, millwright & machinist & agent for Northern Assurance Co.